The museum at the former Nazi death camp Sobibor, in eastern Poland, has closed, at least temporarily, due to insufficient funding. The museum said it had been forced to shut down because the regional government did not provide enough money to keep it open. 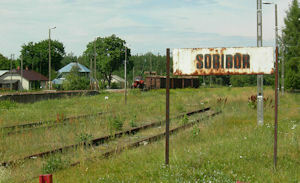 The Sobibor site - near the Polish border with Ukraine - has had around 20,000 visitors every year. An estimated 250,000 people, most of them Jews, were murdered there during the Holocaust. After an uprising at the camp in October 1943, the Nazis razed it and built a farm there in an attempt to conceal the traces of their crimes. The museum this year received less than half of the US$ 360,000 grant it requires to remain open, according to reports. Poland's Ministry of Culture said on Thursday it expected the site to reopen soon under its direct management after the completion of an ongoing administrative reorganization. "As of 1 January 2012, we foresee the creation of the Museum of Sobibor, as an autonomous institution established and funded by the Ministry of Culture," a statement issued in Warsaw said. In the meantime, authorities said the Sobibor museum would be administered by the nearby museum at Majdanek, another former Nazi German death camp located in Lublin. Sobibor guard John Demjanjuk was convicted last month of helping to kill at least 27,900 Jews at the camp. "Holocaust survivors are aghast that the museum at Sobibor, the site of John Demjanjuk's crimes, has closed because of insufficient funding by Polish state authorities," Elan Steinberg, vice-president of the American Gathering of Holocaust Survivors and their Descendants, said in a statement. "The demands of history and our obligation to the education of future generations must be respected so that this solemn place remains open. Whatever the price of memory, the cost of forgetfulness is so much greater," he pointed out.